This week’s Sunday Supper theme is World Vegetarian Day. While I am not vegetarian, I do try to do some meatless meals here and there. 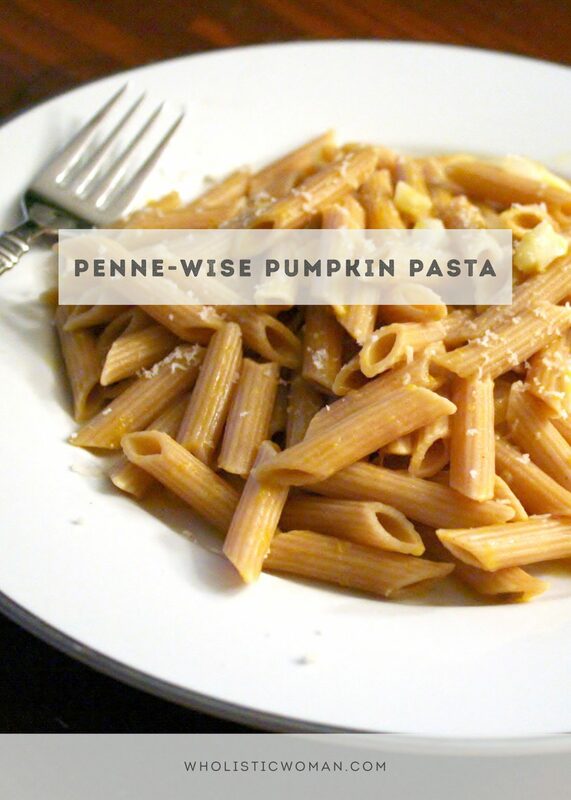 One of the favorites that I’ve tried over the years is Penne-Wise Pumpkin Pasta. Ironically, I came across the recipe when DH was deer hunting. There was a gorgeous hubbard squash (a small-ish one) sitting on the counter and I decided that I wanted to make something with squash. Nothing fussy, preferably something I could use as a main dish (for myself, and I don’t mind vegetarian). Rachel Ray to the rescue! I know, I couldn’t believe it either. Of course, I had to adapt it since she used canned pumpkin puree in her original recipe. But it was the least fussy recipe I could find after searching for pumpkin pasta recipes. I started by preheating the oven to 400F. Then I sliced into the squash. Oh my word, it smelled so delightfully orange! Not orange as in citrus, just . . . autumn orange. I placed it face-down on a cookie sheet and set the timer for an hour, but it was done in half an hour. I knew it was done when a fork pokes in the skin easily. Then I pureed the flesh in a food processor and proceeded with the original recipe. Meanwhile, saute\' the onions and garlic in the oil over medium heat for about 5 minutes. Add remaining ingredients and salt and pepper to taste. Let simmer for about 5 more minutes, until thickened. Stir in the sage if using fresh. Toss pasta and sauce and let people top with the Parmesan cheese. The Verdict: I’m not sure if it’s because I used pumpkin puree instead of canned pumpkin, but the sauce really didn’t thicken much. The flavor, however, was spectacular! (Even with the tarragon instead of sage). If I were to make this again, I might use the sauce from the butternut squash lasagna recipe just mix in the pumpkin puree and serve it over noodles. One bonus of the very liquid sauce, though, is that the leftovers held up well – sometimes whole wheat noodles get overly dry. I’ve had butternut squash and pasta but not pumpkin I need to try this! I love the flavor palate! Pumpkin and sage is a fabulous pairing!!! This is a great recipe. I love pasta with pumpkin sauce and I love the flavor profile of this dish. This is the perfect fall pasta dish. I love pumpkin or squash with sage. Whole Wheat pasta is very sweet and it changes the taste of things. Maybe if the pasta was not whole wheat and you added some some onion instead of shallots which are also sweet it might have balanced out the taste. ?